The 1,700 lb. frame keeps the unit stable and in proper contact with the stump. 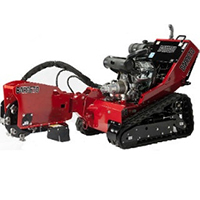 The track system features a true skid-steer type drive and provides excellent maneuverability, allowing the operator to easily transport the unit to and from the work site. Intuitive controls provide one control for each track and a joy stick to control all cutting head functions.There are no belts to the cutting wheel. 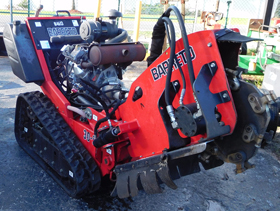 The hydraulic direct drive eliminates the need for expensive drive belts. A brake on the cutting wheel makes for safer operation. The unit will easily fit through 36″ gates. The open and accessible body style allows for easy service and maintenance. A low center of gravity helps the stability of the unit on uneven terrain.